The Catholic Church celebrates the Sacrament of Marriage with you. Marriage is one of the seven Sacraments and is a visible sign of God’s invisible grace. Marriage is a covenant between a man and a woman who freely accept each other as partners in a mutual self-giving in the service of life by the exchange of vows at the wedding ceremony. If you wish to be married at Saint Charles Borromeo Catholic Church, at least one person of the couple must be a registered member of Saint Charles Borromeo. In accordance with Archdiocesan guidelines, couples must contact the parish priest at least six months in advance of the wedding. At this meeting, the wedding date will be formally set. 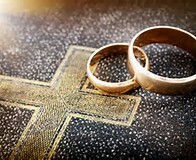 See the section on Holy Matrimony on the Sacraments page for more information.